Relax Deeply. Sleep Soundly. Awaken Refreshed. When a good night’s sleep is what you need more than anything, James Ripley’s Goodnite Guru series delivers just that! You will learn to relax into sleep and awaken refreshed and rejuvenated. Relaxation Strategies Tailored Specifically For You. Invest in a private guided meditation coaching session with James. The Bedtime Blueprint provides you with an easy-to-read map of the territory allowing you to more easily relax, meditate, and sleep anytime & anywhere. 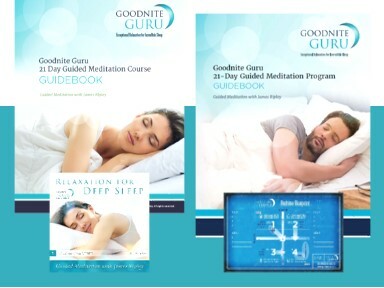 The Goodnite Guru digital download series allows you to easily let go of the stresses of the day and reach a calming presence within. The ability to quiet your mind by listening to the guided meditation is a simple way to achieve restful, restorative sleep. 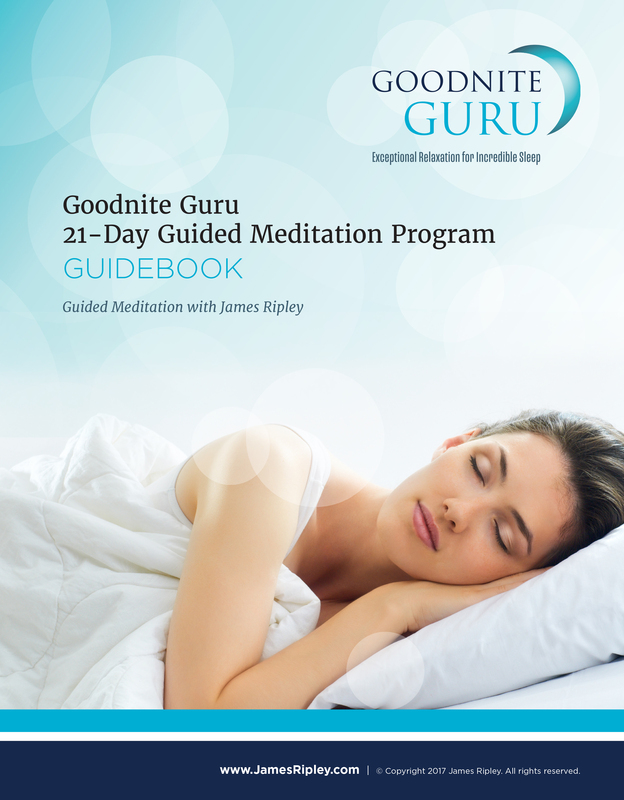 The Goodnite Guru 21-Day Guided Meditation Course is designed for nurturing the body, mind and spirit in a way that is sustainable for hard working people. Invest in a new sleep reality. The stress of jobs, families, and other life responsibilities often leaves us feeling worn out and unable to feel we can allow ourselves the time to wind down and relax when it’s time to sleep. All this giving to others leaves little time to reflect, and to invest in ourselves and our own well-being. This stress can lead to a cycle of poor rest and an empty tank. Maybe this sounds familiar? 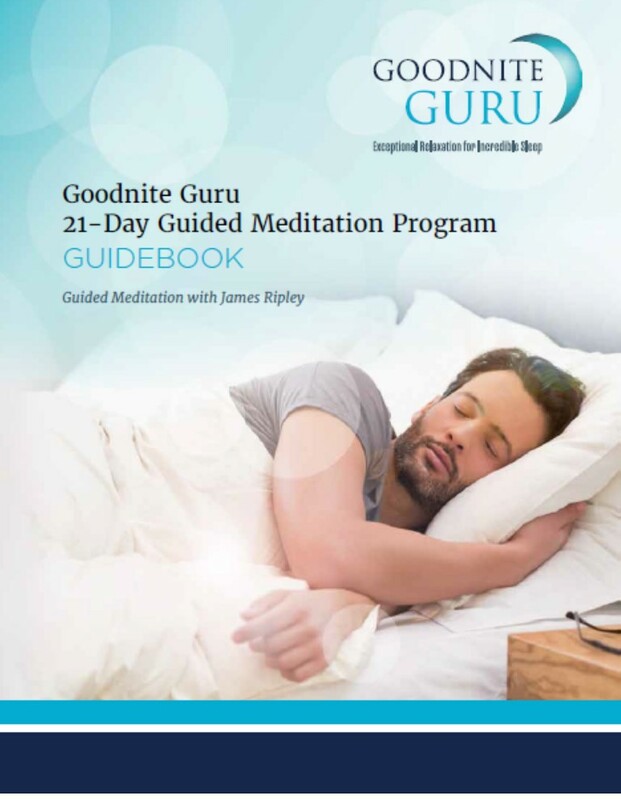 This is the reason I created the Goodnite Guru digital download and the 21-day program, to give everyone the opportunity to have an experience of meditation and deep relaxation on terms that fit into a packed schedule. Simply listen to the download as you fall asleep. It will help you fall asleep by putting you in touch with that quiet calm presence inside… The deeper part of you that knows it’s ok to let go and let everything be as it is, to fill your tank from the inside. How can the Goodnite Guru support you? 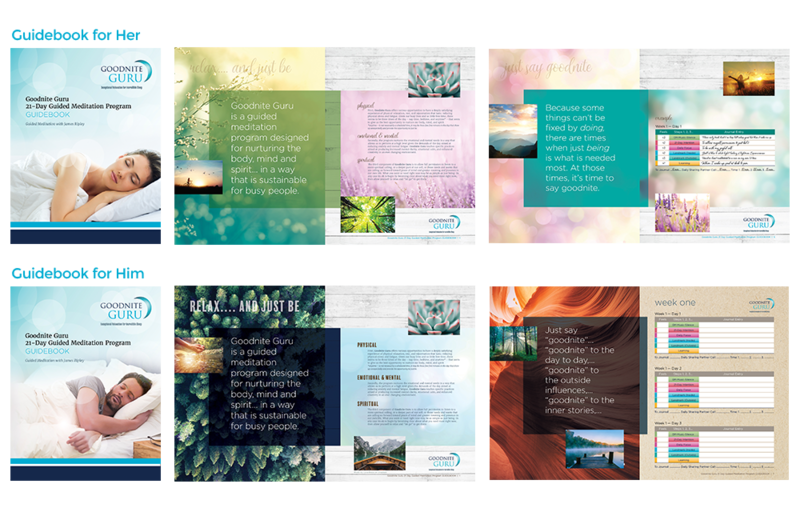 Our 21-day Guided Meditation Program and digital download series are professionally crafted and designed to give you the experience of relaxation for deep sleep. You will be able to release the stress of your day and fall into that quiet calm presence within to achieve restful sleep. In addition, you will be guided to discover what meditation means to you? and supported to create the habit of opening to your deeper purpose & clarifying your daily intentions more skillfully. The Goodnite Guru Sleep Tracks allows you to easily let go of the stresses of the day and get in touch with that quiet calm presence inside. The ability to quiet your mind by listening to the guided meditation is a simple way to achieve restful, restorative sleep. The Goodnite Guru Sleep Track was created to give anyone and everyone an opportunity to have an experience of meditation and deep relaxation without having to put one more thing on their plate. By listening to our Sleep Track as you fall asleep, you will learn to relax and get in touch with that quiet calm, presence inside you. The part where joy comes from. The part that makes you feel alive from the inside. The part that allows us to feel in love with life. Allowing you to awaken energized to new insights for better sleep and life. Listening to the Sleep Track will allow you to say goodnite to the day-to-day, goodnite to the outside influences, goodnite to the inner stories, goodnight to any part of you that believes that doing one more thing will bring you that deep peace that’s waiting inside. Crafted for people who are feeling too tired to meditate or just don’t have the time, I designed the 21-Day Guided Meditation Course for those looking to develop a simple daily intention practice that helps them to fall asleep easier, to relax into a deep sleep, and awaken energized to new insights for better sleep and life. May – Please contact James for more details 720 231-7900. For those who want individual 1-on-1 training. Customize your meditation and sleep habits. Four individual training calls conducted online; or an equivalent in person. 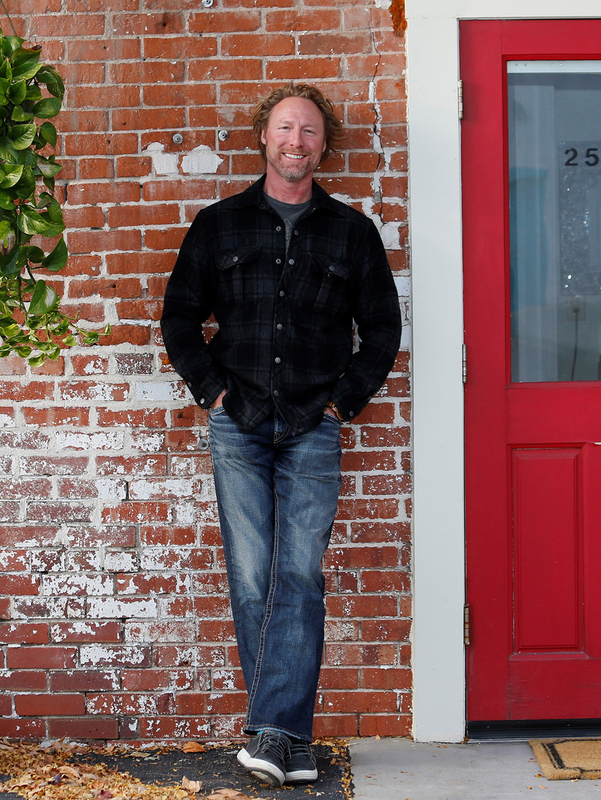 In working with James with a private immersion session, it was profound. Surprising. Insightful. Healing. I can’t begin to describe how incredible the experience was. It was NEW unlike anything I had experienced before. I’ve attended many meditation workshops …and can say my internal experience with this process was unparalleled. So deep. So profound. Sacred. Clarifying. After the session I felt uplifted and relaxed at the same time with a greater trust in life. A sense of levity and enthusiasm and a feeling of a return to myself. For Anyone that wants to explore their consciousness and experience a deeper state of being. James facilitates in the most profound, skillful way. Creating a sense of safety. What perhaps amazed me most was that he wasn’t guiding me in meditation but walking me into my own meditation ..supporting my consciousness in going to a deeper place. Truly magical and blissful. While also healing.